With garage floor epoxy the best step you can take to create the most durable and toughest flooring for your garage is to apply a garage floor epoxy coating. 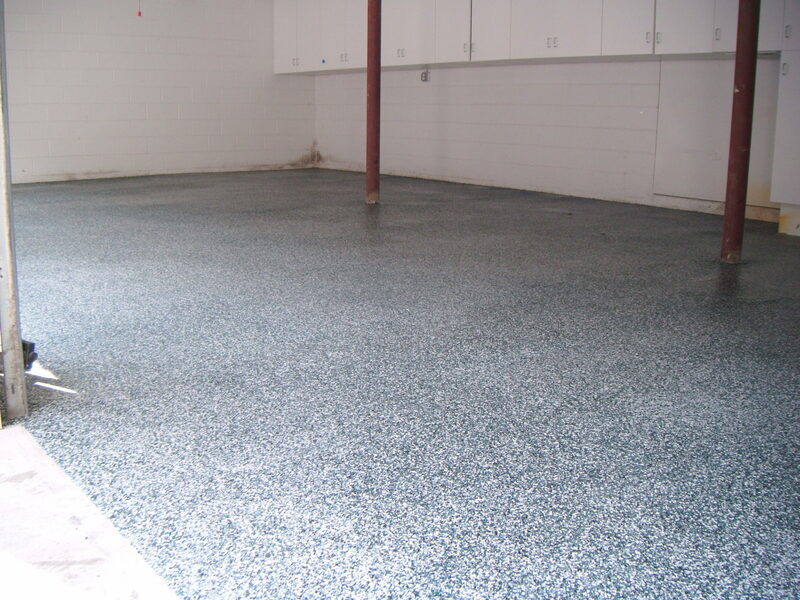 Unlike traditional garage floor paint which simply dries on the surface it is applied to, our 100% solids, high build garage floor epoxy coating undergoes a chemical reaction that results in a thick coating, tightly bonded to the prepared surface. You are not only left with a quality flooring that looks nice, but also one that can withstand abrasions, stains, impact, and chipping. Gone are the days you have to worry that dropping a heavy tool or dragging the lawnmower out of the garage will result in unsightly scrapes and scratches on your epoxy garage floor coating. ArmorClad 100% solids garage floor epoxy is the most durable, highest performance coating that can be legally made and sold to the public. Contractor grade, now packaged for homeowner use. Garage floor epoxy is resistant to moisture, dirt, chemicals, and salts making it ideal for those living in climates where rain and snow are common as the seasons change. Further, it prevents unpleasant dirt and dust from spreading throughout your garage and on your possessions, typically caused when cracks and other flaws in your concrete create a powder and dust that is kicked up by foot traffic or vehicles. A garage floor coating acts as a sealer, thus making dusty garages a thing of the past. Your garage will be safer, cleaner, and much easier to clean. When it comes time to clean your garage floor epoxy coating, you will notice that much less time is required. With simply a mild soap and mop, or a broom, messes are picked up easy and without hassle. This comes in handy particularly during the winter in states where the roads are coated with salts. ArmorPoxy is proud to offer a large variety of epoxy flooring for your garage and has tens of thousands of satisfied customers across the country. ArmorClad, our industry-leading epoxy floor coating system designed specifically with garages in mind, is unmatched by any other garage floor coating system on the market today, due to our innovative and proprietary Adaptive Molecular Technology. The ArmorClad process starts when you first etch your garage floor with our ArmorEtch etching solution, which forms millions of microscopic pores in the flooring. During this prep stage, your flooring will undergo a chemical reaction that results in a bonding over 100x stronger than steel. Next, ArmorClad is applied and becomes impossible to detach. If you choose to grind your floor, we suggest using the ArmorClad primer as a pre-coat. ArmorClad is great for every home and can be applied by anyone. No professional installation is needed! 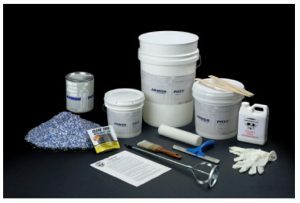 The AmorClad Epoxy Flooring Kit comes with all the prep and application materials you’ll need, including easy to follow instructions. An easy to follow video is available from this website or online. For smaller garage floors, you may only need a few hours to apply your epoxy coating. ArmorClad is available in a wide variety of base colors and over 100 decorative fleck colors that can be chosen to match any decor. We want you to have a garage floor paint that matches the style of your home, and for this reason, we offer six standard beautiful color combinations with decorative flecks, or you can design virtually any combination of base and fleck colors you want. Of course, solid color floors are available too. See our online color picker below to help you design your floor. Contact our expert epoxy flooring specialists today to design the garage flooring of your dreams at an affordable price that fits your budget. ArmorClad is available either with or without top coat. We also offer several different top coats from our standard grade Ultraglaze up to our 2-part military grade top coat, ideal for working garages or where fuels and solvents may come in contact with the floor.